My mother often tells the story of when I first learned to walk: Instead of sluggishly taking one step at a time, I would quickly take five or six steps as I accelerated into the floor or surrounding walls — Bang! She says I learned to run before I would walk. Based on my old scars I think she’s right. Many families have memories of their children’s first steps. But how about baby’s first drive? This Sunday we interview Christina Hospodar, finishing her M.S. in Kinesiology with an option in Adapted Physical Activity, who is working to better understand how providing modified ride-on cars to children with disabilities as a source of mobility can help to close the developmental gaps between children with disabilities and their typically developing peers. Throughout infancy and early childhood, movement is key to learning. Mobility at a young age allows children to begin exploring their surroundings, which helps with not only motor development, but also language, social, and cognitive skills. While crawling towards mom or chasing birds in the park may seem like that is all it is, these experiences are embedded with inherent learning opportunities; learning to move in and of itself is a learning opportunity! Once you can direct your own movement, this propels a cascade of cognitive advancements. For example, once babies begin walking and their hands become more available to explore objects, they begin bringing favorite toys or novel finds to parents, and consequentially hear more words as they engage in these social bids. Many developmental advancements arise following the ability to independently move through their environment, of course alongside many smiles and giggles. 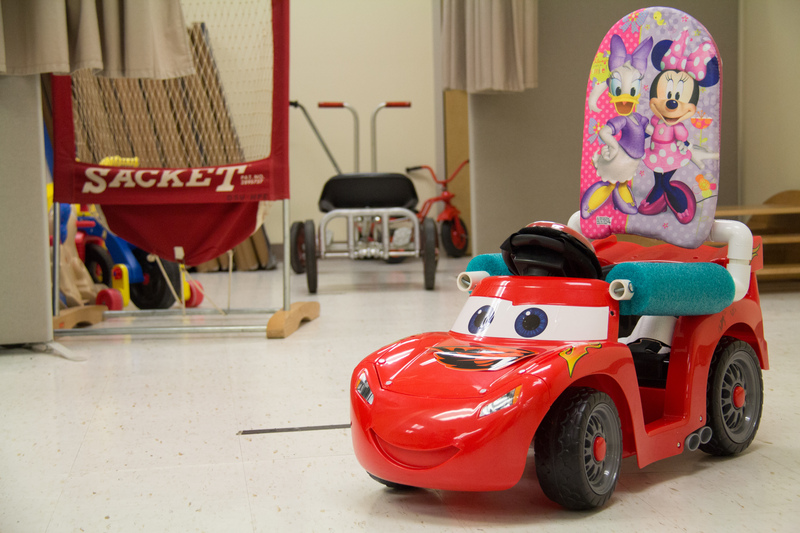 Go Baby Go is a community-based outreach program that provides modified ride-on cars to children with disabilities as a source of self-directed mobility. 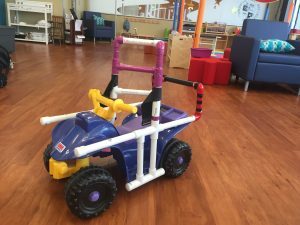 By modifying the activation switch and adding more supportive seating with common materials such as PVC pipe, pool noodles, and foam kickboards, children with disabilities can use the ride-on cars as an accessible powered mobility device. A more recent version of the modified ride-on car is called a Sit-to-Stand (STS) car. Here, there is a reverse-activated switch in the seat, so the child must pull to stand and remain standing in order to power the vehicle. This combines functional training with the experience of powered mobility. That’s where the work of the Social Mobility Lab at Oregon State University comes back into the picture. Under the direction of Dr. Sam Logan, a large part of Christina and her lab group’s work revolves around Go Baby Go Oregon, one of about 75 national and international chapters. 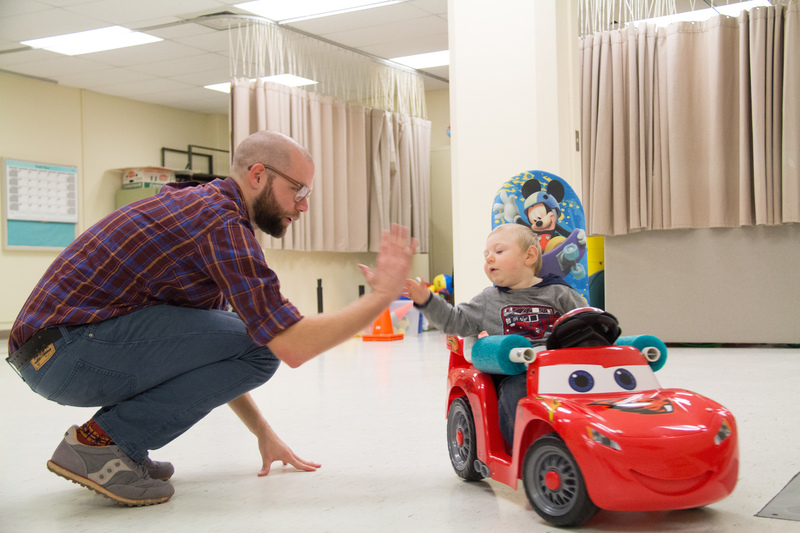 Started in 2012 at the University of Delaware by Dr, Cole Galloway, Go Baby Go is a community-based outreach program that provides modified ride-on cars to kids with disabilities as a source of self-directed mobility. With a total cost of around $200, the modified ride-on cars are affordable, portable, and perhaps most importantly, FUN. Ride-on cars can be purchased from standard box stores like Walmart or Toys R Us. Then, these cars are electrically and structurally modified to make them more user-friendly and accessible to any child. 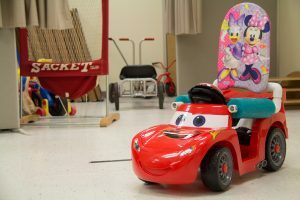 Most standard ride-on cars are operated by a foot pedal or very small button switch, so in order to make the vehicle more accessible to children with disabilities, they modify the electrical wiring by adding a large easy-to press activation switch. Now, the car will move via an oversized button on the steering wheel. They also reinforce the structure and support of the vehicle with PVC pipe and pool noodles so there are more soft-touch contact points to keep the child secure. Maybe the child has a vision impairment? They can make the steering wheel a very big and very colorful button. What if the child needs to be able to sit upright? They design a support system integrated into the car so the child can maintain an upright posture. The essence of being a kid is mostly about playing and exploration; this program and these devices are helping to make sure that all kids can be kids and get into just as much trouble as anybody else. Christina’s work goes beyond the community-outreach sector of Go Baby Go. With Dr. Logan and lab mates, Christina is working to quantify the benefits of the modified ride-on cars and determine how they can be optimally used. Anecdotally, first drives are filled with big grins, happy dancing, and engaged attention. But how do you capture that in research? Her Masters project aims to understand how use of the modified ride-on cars relate to tangible outcomes like onset of independent driving and independent walking. This intervention is unique in that researchers incorporated elements of physical therapy within the vehicles to sneakily have children practice motor skills. If you want children to practice standing, you have to incentivize that movement. By wiring a negative activation switch in the seat, the child must stand up in the car to move forward. When they sit down, the car stops moving. Therefore, the children practice pulling to stand and maintaining balance, physical therapy exercises that would be very difficult to get children to do without that positive incentive of freedom of movement provided by the car. Christina’s thesis focuses on a year-long progressive modified ride-on car intervention for infants with Down syndrome that utilizes the seated cars as well as this more advanced sit-to-stand version to encourage exploration and motor skill development. We will discuss her findings, which suggest that children who spent more time with the vehicles and were more consistent with usage potentially had better motor outcomes. Adapted Physical Activity graduate students (from left to right: Michele Catena, Samantha Ross, and Christina Hospodar) presenting research from the Social Mobility Lab at the 2017 Society for Research in Child Development (SRCD) Conference in Austin, Texas. As I write this on a sunny afternoon sitting on a bench overlooking the MU quad, there are seniors taking graduation photos and families meandering through the courtyard. One family walks by the pair of 120-feet tall incense cedar trees. The little sister walks off the pavement and onto the grass, tracing the perimeter of the wide droopy branches. She stops. Looks up and down in awe, wonder, and amazement. Maybe she’ll be a forester someday, perhaps a botanist, or maybe an ornithologist with all the noisy bird conversations happening way up high in the canopy. But in a snap, her parents turn around and wave her to return. She sprints back towards the group. Because of her ability to freely explore her environment, life has left her with a new seed of curiosity. This embodies the spirit of Go Baby Go, where self-directed mobility is a fundamental human right. Be sure to listen to the interview on Sunday May 13th at 7PM on KBVR 88.7 Corvallis or you can listen live online. Christina is nice enough to do the interview the day before her defense so if you’re interested you can see her research talk on Monday May 14 at 2 PM in Hallie Ford Center room 115. In the fall Christina will be moving onto a PhD program at NYU in the Cognition and Perception program within the Psychology Department. There, she will study infant motor development under the direction of Dr. Karen Adolph. If you want to find out more about the Go Baby Go program, you can look at Oregon State’s Chapter page, the greater Oregon Facebook page, and the national website to look for contacts or access to local sites around the US. 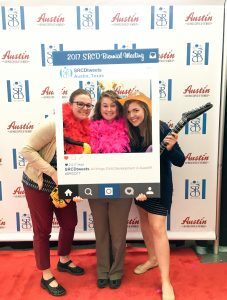 This entry was posted in College Health and Human Sciences and tagged childhood development, children, disability, mobility on 2018-05-13 by Adrian Gallo.